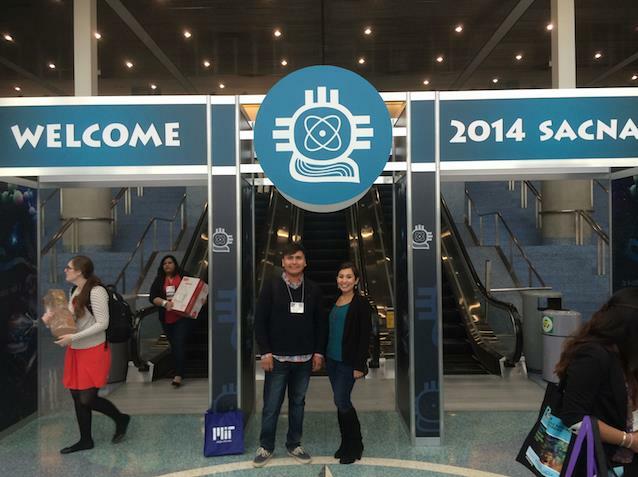 Every year the Society for the Advancement of Chicanos and Native Americans in Science (aka SACNAS) hosts a national conference in the hopes of gathering various universities, scientific organizations, scientists, researchers, and future researchers together to share ideas and help students that belong in minority ethnic groups get the edge they need to make it in today’s academic world. 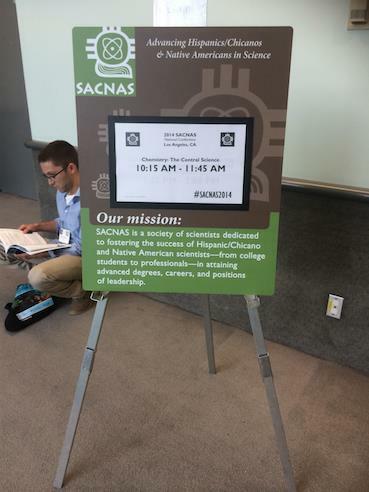 This years SACNAS Conference was held in Los Angeles and I was there to experience the conference amenities and share with potential candidates my experience in the REU program I participated in over the summer. If you would like to read about my experience in the Integrated Optics for Undergraduate-Native Americans program click here. 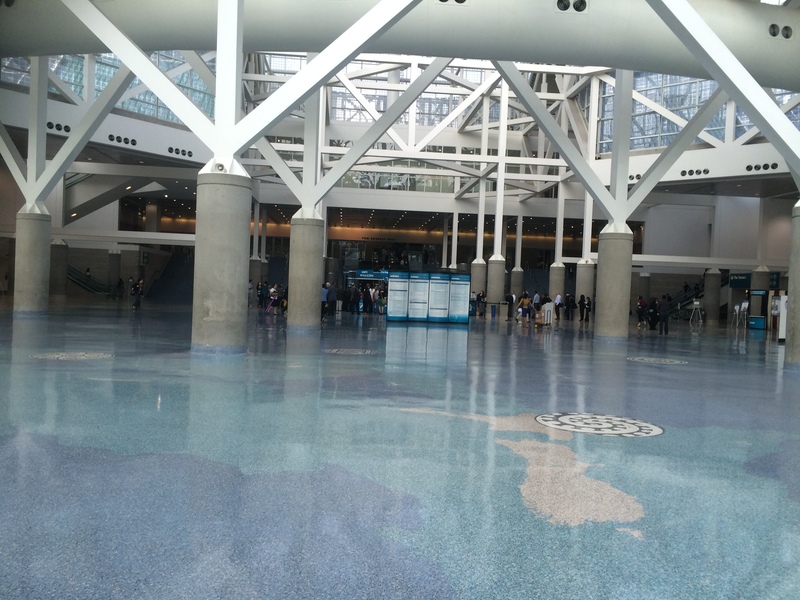 The conference ran from October 16th-18th, and was held at the Los Angeles Convention Center, which to my surprise was right next door to the famous Staples Center. 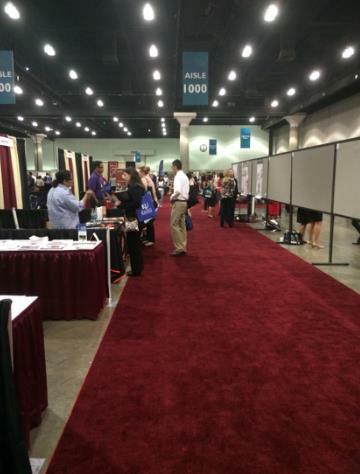 The view when you first walk into the convention. 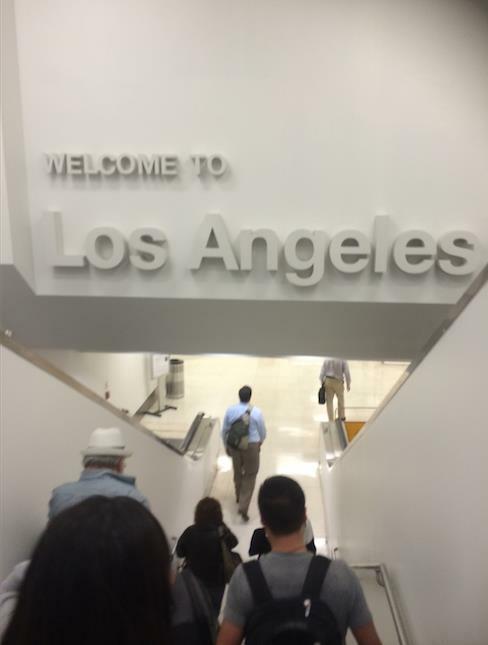 The first day, I focused on going to professional development meetings and some lectures I found interesting. After the luncheon was “Conversation with Scientists” where a panel of professors from various disciplines sat a round table and talked with students about a variety of topics and politics ranging from concerns about what to expect from graduate schools, funding, post-doc positions, and many other topics. I had the pleasure of speaking with a professor from Princeton who spoke about her experiences leaving and coming back to her position after establishing a family, and the work environment she encounters on a day-to-day basis. I also spoke with a small liberal arts college professor who shared her experience and the surprising amount of lab-work she has the pleasure of doing while not worrying so much about writing grants for funding. 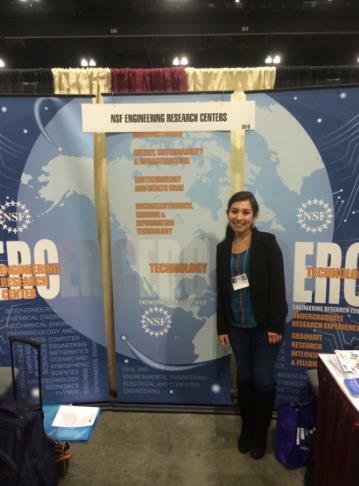 I’m so glad I attended; it really opened my eyes to alternative Post-doc positions I didn’t know I had an option to. Next, was the booth! I got to meet up with my old buddies from the summer REU we participated in and it was great to see them again! We had so much fun talking about our future plans and what we have been doing since the summer. 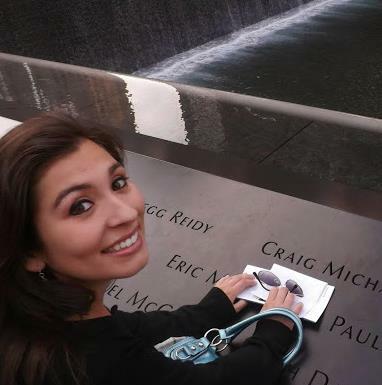 I am so blessed to have known these two, although I was sad that more of us couldn’t make it. I still have them in my heart, and do hope they are all doing well. Excited to meet potential applicants! NSF and their available programs. 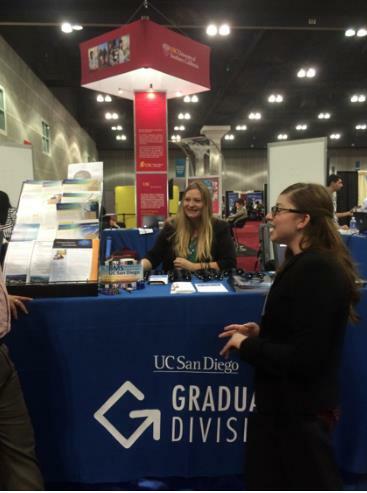 Since we took part in an NSF funded REU we spoke mostly about the IOU-NA program and there were some very interested candidates, I hope they seriously consider applying because you never know what will happen! After a full day, it was time to go for me. I got one last picture, and had to head home. 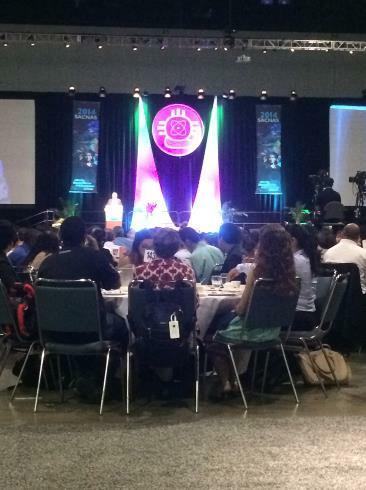 My experience at this year’s SACNAS conference was more than incredible; I wish I had known about all the opportunities that were available to me when I was in my early undergraduate career. I can’t change the past but I am doing my best to plan for the future and NSF has played a key role in helping me build a foundation for that future. I hope that the message I tried to convey to students at the conference was that there is not much consequence in applying for these programs. It’s ok to put yourself out there, it isn’t that difficult, and after all there’s little to lose, and so much to gain–so I say apply! 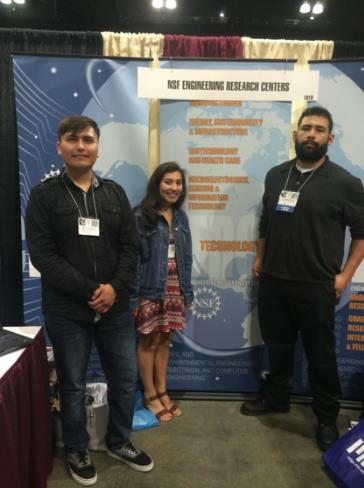 This entry was posted in College Life, Education, Research and tagged College of Optical Science, Conference, Native American, professionalism, research, REU, STEM, University of Arizona. Bookmark the permalink.